حق‌شناس گرگانی, سعید, انصاری نیا, سیاوش, قلعه‌نوعی, محمود. (1397). ارزیابی و برنامه‌ریزی مجتمع‌های صنعتی سبز به عنوان ابزاری برای توسعه پایدار صنعتی (نمونه موردی: مجتمع صنعتی سبز شهرستان کرج). فصلنامه جغرافیا ( برنامه ریزی منطقه ای), 33(1), 185-205. سعید حق‌شناس گرگانی; سیاوش انصاری نیا; محمود قلعه‌نوعی. "ارزیابی و برنامه‌ریزی مجتمع‌های صنعتی سبز به عنوان ابزاری برای توسعه پایدار صنعتی (نمونه موردی: مجتمع صنعتی سبز شهرستان کرج)". فصلنامه جغرافیا ( برنامه ریزی منطقه ای), 33, 1, 1397, 185-205. حق‌شناس گرگانی, سعید, انصاری نیا, سیاوش, قلعه‌نوعی, محمود. (1397). 'ارزیابی و برنامه‌ریزی مجتمع‌های صنعتی سبز به عنوان ابزاری برای توسعه پایدار صنعتی (نمونه موردی: مجتمع صنعتی سبز شهرستان کرج)', فصلنامه جغرافیا ( برنامه ریزی منطقه ای), 33(1), pp. 185-205. حق‌شناس گرگانی, سعید, انصاری نیا, سیاوش, قلعه‌نوعی, محمود. ارزیابی و برنامه‌ریزی مجتمع‌های صنعتی سبز به عنوان ابزاری برای توسعه پایدار صنعتی (نمونه موردی: مجتمع صنعتی سبز شهرستان کرج). فصلنامه جغرافیا ( برنامه ریزی منطقه ای), 1397; 33(1): 185-205. در طی قرن گذشته، برخلاف اصول پارادایم توسعه‌پایدار، فرایند جهانی‌شدن و رقابت بین‌المللی سبب شکل‌گیری یک مسابقه نامحدود برای رشد اقتصادی میان کشورها گردیده‌است. مواجهه با اثرات منفی چنین رشد اقتصادی (مبتنی بر تولید و مصرف‌انبوه)، در کنار گسترش توجهات جهانی به مسائل زیست‌محیطی و ظهور مفاهیمی نظیر تولید پاکیزه، بوم‌شناسی‌صنعتی و مشاغل‌سبز، موجب‌شده بسیاری از کشورها، مجتمع‌های صنعتی سبز را به عنوان یکی از ابزارهای تحقق پارادایم توسعه‌پایدار در زمینه توسعه صنعتی مورد توجه قرار دهند. از این‌رو، هدف کلی این مقاله "برنامه‌ریزی یک مجتمع صنعتی سبز متناسب با ویژگی‌ها، امکانات و محدودیت‌های شهرستان کرج" می‌باشد. تحقیق از نوع پژوهش‌های کاربردی و به شیوه اکتشافی انجام گرفته‌است. محدوده مطالعه شهرستان کرج است و داده‌های مورد استفاده همگی داده‌های ثانویه هستند که به روش اسنادی جمع‌آوری و تحلیل شده‌اند. نتایج تحقیق نشان می‌دهند که با توجه به قابلیت‌ها و محدودیت‌های شهرستان کرج، از میان انواع مجتمع‌های صنعتی سبز، مجتمع صنعتی سبز کشاورزی برای این شهرستان مناسب می‌باشد. با توجه به ترکیب بهینه صنایع برای دستیابی به بیش‌ترین هم‌افزایی‌ها در تبادلات آب، انرژی و مواد فرعی و نیز با درنظرگرفتن روندهای گذشته صنعت و کشاورزی شهرستان، این مجتمع با مساحت حدود 160 هکتار شامل مجتمع تبدیل پسماند، خوشه فرآوری موادغذایی، خوشه تولیدکنندگان متراکم مواد‌غذایی، مزارع و باغات پشتیبان و موسسات آموزشی و برای اشتغال حدود 3000 نفر برنامه‌ریزی شده و می‌تواند از سه جنبه تبادل آب، مواد فرعی سیستم و انرژی، به بسته شدن اکوسیستم صنعتی کمک کند و در کنار آن، مزایای شناخته شده کشاورزی شهری را نیز فراهم سازد. During the last century, world industrial development, globalization and international competitions has led countries into a race of unlimited economic growth. Encountering the negative effects of economies based on mass production and consumption caused many countries to search for an alternative paradigm for development. With acceptance of new ideas such as cleaner production and industrial ecology, several countries adopted Eco-Industrial park policy as a tool for achieving sustainable development. Therefore, the purpose of this article is planning an eco-industrial park in Karaj Shahrestan. For this purpose, case study research has been applied. The study scope is Karaj Shahrestan and using secondary data, the applicability of an eco-industrial park has been analyzed. Findings of research show that considering potentialities of Shahrestan, between different themes of EIPs (including: Agro-EIP, Resource Recovery EIP, Renewable Energy EIP, Power planet EIP and Petrochemical EIP), Agro-EIP is most appropriate theme for Karaj shahrestan. This Agro-EIP is planned with 160 ha Area and for employment of 3000 employees and its potential members are food processing cluster, dense food production crops (greenhouse and aquaculture farming), urban and agricultural waste recycling plant, solar thermal energy production plant, anaerobic wastewater treatment and educational institutions. This EIP can create some water, material and energy exchanges between its members and hence helps to closing the industrial ecosystem and moreover, by developing urban farming, helps to reduction of food production and consumption distance, improvement of local micro-climate, carbon dioxide balance in the cities, promote biodiversity, and leads to improvement of urban environment. 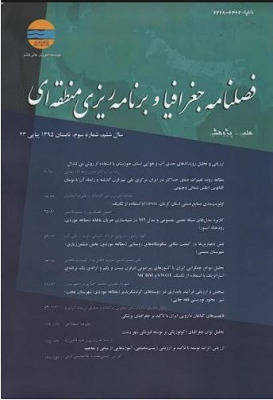 اداره جهاد کشاورزی استان تهران (1388). خلاصه اطلاعات تولیدات کشاورزی شهرستان کرج در سال 1386. سایت اینترنتی اداره جهاد کشاورزی استان تهران (www.tehran.agri-jahad.ir). خیاطی، مهدی و مشعوفی، محمد (1386). اندازه گیری و تحلیل بهره‌وری کل عوامل تولید در مزارع پرورش ماهی، مطالعه موردی: مزارع گرمابی و سردابی استان گیلان. اقتصاد کشاورزی و توسعه، تهران: شماره 59. دهقانی سانیچ، حسین و زارعی، قاسم (13866). بررسی مدیریت آبیاری و کارایی مصرف آب در گلخانه‌ها، مسائل و چالش‌ها، تهران: اولین کارگاه فنی ارتقاء کارایی مصرف آب با کشت محصولات گلخانه‌ای. شرکت مهندسی مشاور نیروی خراسان (منیران) (1387). امکان سنجی تولید محلی برق در شهرک صنعتی سپیدان استان فارس. تهران: وزارت نیرو- دفتر خصوصی‌سازی صنعت برق ایران. مهندسان مشاور باوند (1387). برنامه راهبردی و طرح ساختاری (جامع) حوزه شهری کرج- شهریار سطح یک: مقیاس حوزه شهری. تهران. وزارت جهاد کشاورزی (1386). آمارنامه کشاورزی استان تهران، تهران. وزارت صنایع و معادن (1388).آمار واحدهای صنعتی کشور، تهران: دفتر آمار و اطلاع‌رسانی وزارت صنایع و معادن. Anbumozhi, V. (2007). Eco-Industrial Clusters in Urban-Rural Fringe Areas. Institute for Global Environmental Strategies - Kansai Research Centre. Bringezu, Stefan and Moriguchi, Yuichi (2001). Material flow analysis in Ayres, Robert U. and Ayres, Leslie W. (2001): A Handbook of Industrial Ecology, UK: Edward Elgar. El Haggar, Salah M. (2007). Sustainable Industrial Design and Waste Management. United States of America:Elsevier Academic Press. Fleig, Anja-Katrin (2000). Eco-Industrial Parks A Strategy towards Industrial Ecology in Developing and Newly Industrialized Countries. Deutsche Gesellschaft für Technische Zusammenarbeit (GTZ) GmbH. Grant, Gabriel (2006). Information Technology for Industrial symbiosis Birmingham:Yale school of Forestry and Environmental Studies. Heeres, R.R. and Vermeulen. W.J.V and Walle, F.B. de (2004). Eco-industrial park initiatives in the USA and the Netherlands: first lessons. Journal of Cleaner Production, no.12. Hodge, Matthew M. (2007). Quantifying Potential Industrial Symbiosis: A Case Study of Brick Manufacturing. Submitted for the Engineering Systems Divisions in Partial Fulfillment of the Requirements for the Degree of Master of Science in Technology and Policy, Massachusetts Institute of Technology. Industrial Economics Incorporated Cambridge (1998). Applying Decision Support Tools for Eco-Industrial Park Planning, A case study in Burlington, Vermont. Office of Policy, Planning and Evaluation, U.S: Environmental Protection Agency, United States of America. Lambert, A.J.D. and Boons, F.A. (2002). Eco-industrial parks: stimulating sustainable development in mixed industrial parks. Journal of Technovation, no.22. Lifset, Reid and Graedel, Thomas E. (2001). Industrial ecology: goals and definitions in Ayres, Robert U. and Ayres, Leslie W. (2001): A Handbook of Industrial Ecology, UK: Edward Elgar. Lowe, Ernest (a) (2001). Eco-industrial Park Handbook for Asian Developing Countries. Report to Asian Development Bank, Vol.1. Lowe, Ernest (b) (2001). Eco-industrial Park Handbook for Asian Developing Countries. Report to Asian Development Bank, Vol.2. Lowe, Ernest (c) (2001). Eco-industrial Park Handbook for AsianDeveloping Countries. Report to Asian Development Bank, Vol.5. Mirata, Murat and Pearce, Richard (2006). Industrial symbiosis in the UK, in Green, Ken (2006): Industrial Ecology and Spaces of Innovation, Edward Elgar Publishing, Inc.
Potts Carr, Audra J. (1998). Choctaw Eco-Industrial Park: an ecological approach to industrial land-use planning and design, Journal of Landscape and Urban Planning, no.42. Stano, Joseph (2008). Finding Common Ground: Using Water and Heat Optimization to Facilitate Eco-Industrial Development, A Thesis Submitted in Partial Fulfillment of the Requirements for the Degree of Master of Applied Science, Vancouver: the University of British Columbia. Haes, Udo de, Helias A. (2001). Industrial ecology and life cycle assessment in Ayres, Robert U. and Ayres, Leslie W. (2001). A Handbook of Industrial Ecology. UK: Edward Elgar. United Nations Industrial Development Organization (UNIDO) (1997). Industrial Estates Principals and Practices, UNIDO. Veiga, Lilian and Bechara, Elabras and Magrini, Alessandra (2009). Eco-industrial park development in Rio de Janeiro, Brazil: a tool for sustainable development, Journal of Cleaner Production. White, Robert M. (1994). The Greening of Industrial Ecosystems Washington, D.C: National Academy of Engineering.